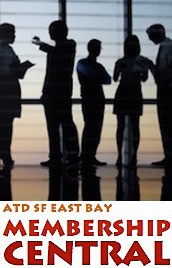 ATD SF East Bay - "Can Leaders Be Cloned (And other Monumental Leadership Controversies)"
"Can Leaders Be Cloned (And other Monumental Leadership Controversies)"
What are the qualities of good leaders? Can they be trained and replicated, or not? Is leadership genetic and can it be cloned? Sound like a lively and potentially controversial discussion? You bet! Come and observe different leadership approaches do battle and leave with a fresh perspective and new insights on leadership development that will keep you at the top of your game. Marci Meaux is on the Board of Directors of ASTD National and currently holds the position of VP, Sales Enablement at Cisco. Marci is very clear on what good leadership looks like - and how to get it. Kevin Martin owns Mentor Training, Inc. and holds an MS in Management Science & Engineering from Stanford University. Kevin's work on strategic leadership and emotional intelligence is very compelling. Rebecca Morgan is a best selling author, certified speaking professional, workplace effectiveness and management consultant, and has appeared on TV and national Public Radio. We have invited Rebecca to bring a contrarian perspective and to challenge notions on leadership.